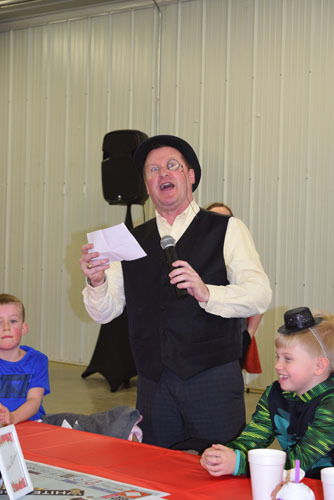 The mascot of Monopoly, “Rich Uncle Pennybags,” played by Scott Wylie, emceed the CEO fundraising event at the Floral Hall on Saturday night. The White County CEO class of 2019 debuted their “White County-Opoly” game board with approximately 130 in attendance. The crowd was composed of investors and mentors of the class. The annual fundraiser is held to showcase the talents of the class in a group business. The funds raised will finance their individual business ideas that will debut sometime later this spring. The White Count-Opoly game featured all local businesses on the game board and followed a theme of “shop local.” Playing cards also featured local businesses. After a buffet dinner provided by Yesterday’s, the attendees got to play the new game for 45 minutes, after which the players returned their holdings to the “bank” who determined who the winners were at each table. Sheriff Doug Maier and deputies were on hand to make sure those who landed on the “go to jail” spot were perp walked throughout the room on their way to the “jail.” Police sirens were heard, played by investor Joey Lane’s sound system. The silent auction winners were Doug Maier, Beth York, Annsley Healy, Jane Lamp, Marcy Hoskins, Paul Healy, Leigh Gray, Susan Odum, Nancy Winters, Phil Healy, and Ryan Richards. The class is comprised of six CWC students: Claire Shepard, Courtney McKay, Dakota Fleck, Gaetano DiMaggio, Tyler Hoskins, Alissa Hampton and five NCOE students: Baylee Sutton, Becca Westbrook, Kristina Richards, Laney Cawthron, and Laura Martin.